Here I am with a new review for Lemail Wig! 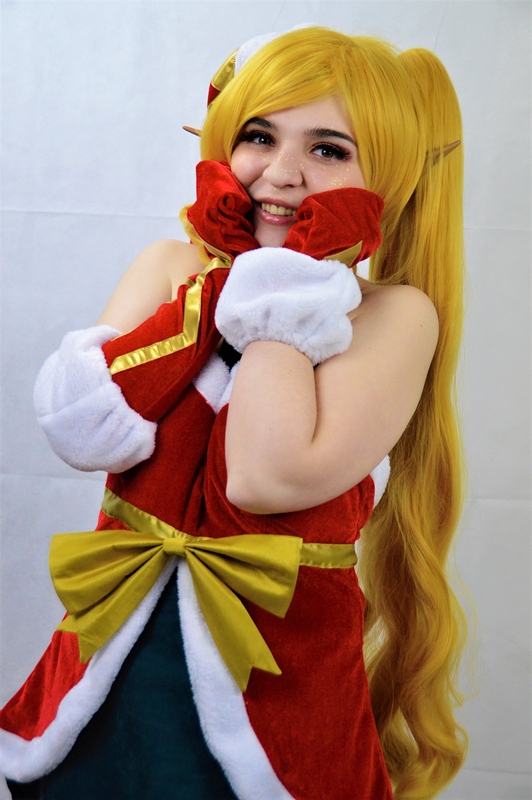 This time they sent me the full set for Jinx Ambitious Elf, so I’m going to review both wig and costume. You can choose to buy just one of them, wig or costume, but it is possible to buy even the pointed ears for just 2.99$. The costume includes dress, stockings, gloves, the neck star, bow and hat. The wig includes a short blonde base, two ponytails and a wig net. The fabric used for the dress is velvet, it isn’t stretch but if you order according to the costume’s size table it will fit perfectly. The inside is lined with lining-satin fabric and it has a zip and a button on the lateral part to wear it. The stockings is in stretchable fabric but I think this is something like onesize so if your legs are way too big you may have some problems. Every part of this costume is absolutely confortable, soft and in the perfect colour. The star is made with 3D printing, you can place it on the costume with a pin on the back part just like the yellow bow! Just like every Jinx skin there is a pair of gloves, one longer than the other with gold faux leather details sewed on. The white part isn’t sewed on the gloves, you have to put them on separately and this is great, they are stretchable and make your gloves stay in place (so that the long one doesn’t fall down). The hat is long 125cm, and you can fix it to the wih just by using a clip (I used just one clip and it didn’t move for all the day). I had to ask for a female XL size, and I was a little sas about this because their maximum size is the XXL. But they use a chinese size table so it is perfectly normal. XL fits me perfectly and I have a 94cm for the bust, but if you have more than 98cm (XXL size) you may have some problems with this. The price is 25.99$ and it is absolutely nothing for this costume. It is well sewed and made, it has lots of details and it perfectly respects the 3D model of the character in game (Riot always have differences between 3D models and splasharts). This price is nothing for what you get, and if you are looking for a Jinx Ambitious Elf costume this is surely what you need. About the wig, the colour is very beautiful. It is perfect for Jinx, it is a realistic blonde and it is full of fiber (expecially in the ponytails). It is composed by a base wig, short with a longer part on the right to style for Jinx hearstile and two ponytails 80cm long. You can choose if you want to wear both the ponytails and put the right one onto the hat or just wear the left one and wear the hat without the ponytail if you want. The wig is heat resistant, and you can easily style it with hair spray. I think this wig is one of the best I ever had and absolutely the best one I got from lemail since I started with cosplay years ago. The price is 18.99$ but it is worthy for this wig, it is a great price for a ponytail wig. I recommend this one for your Jinx cosplay and I’m already looking for other characters with a similar colour and hairstyle in order to make more makeup tests like already did for Morgana. I recived everything in just three days with DHL shipping, you can choose a cheaper one but you will get it slowly. The cheapest shipping on the website costs around 15$ and it usually tooks something like a month to arrive. Thank you very much for this opportunity, I really loved to work with this store. The customer service was kind and answered to any question super fast, they were always kind and open to any question. If you would ever have any problems with you order you can just send them a message and they will fix everything as soon as possibile so I’d like to leave a 5stars mark even for the customer service. Thank you for reading this review, I hope this may be helpfull for anyone who is interested in this cosplay. 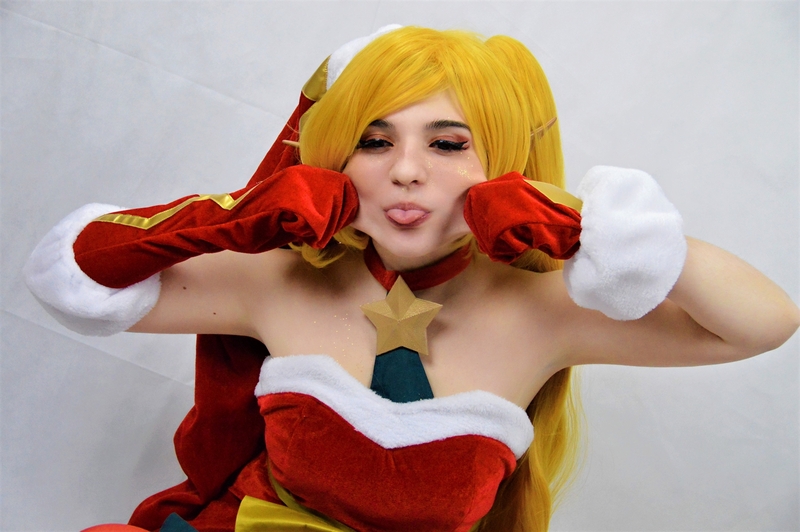 This entry was posted in Buy Cosplay Wigs, Cheap Cosplay Costumes, L-email Wig review, L-email Wig Sponsorship, Wigs and tagged jinx cosplay, lemail wig review, lol cosplay.